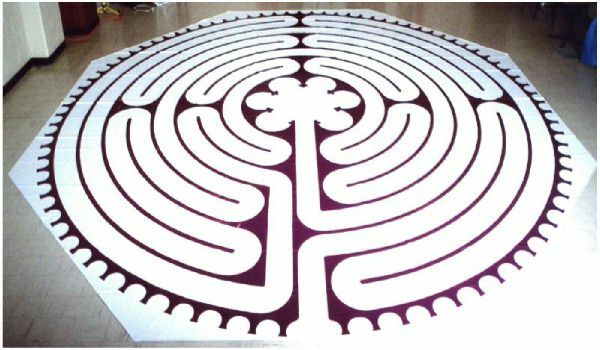 An 8-Circuit Chartres-type labyrinth for mid size spaces. The Renewal© Labyrinth meets the need for a true Chartres-style labyrinth in a smaller space. Its diameter (24 feet) allows its use in nearly any meeting room, and its lighter weight offers convenient one-person portability and set up. The eight circuit design honors the number eight, which historically is associated with renewal and rebirth. The Renewal design retains several notable features found in the Chartres Labyrinth. 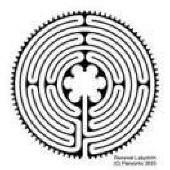 In our years of facilitating full size Chartres labyrinth walks, walkers often mentioned these features as important to their personal labyrinth experience. There are 85 lunations/teeth around the perimeter, with what would be the 86th lunation represented by the entry way. This keeps proper proportions in all the design elements and stays true to the look and feel of the full size Chartres design. NOTE: The entry path begins with a turn to the right, to be consistent with the flow of the paths on the full size Chartres, which has even numbered paths moving counter-clockwise on the journey to the center! The Renewal© Labyrinth is offered in the size range of 24-32 feet. It can be created in quality 12-oz Canvas, Durable wear-resistant fabric, or our new Poly Canvas in your choice of line colors and diameters.